In a previous article we described the most modern class of fast attack missile craft (FACM) of Hellenic Navy (Πολεμικό Ναυτικό), the Roussen class. However, the backbone of the fast attack craft fleet consists of two older classes, the Laskos and Kavaloudis class. Laskos class is known as type Combattante IIIA while Kavaloudis class as type Combattante IIIB. 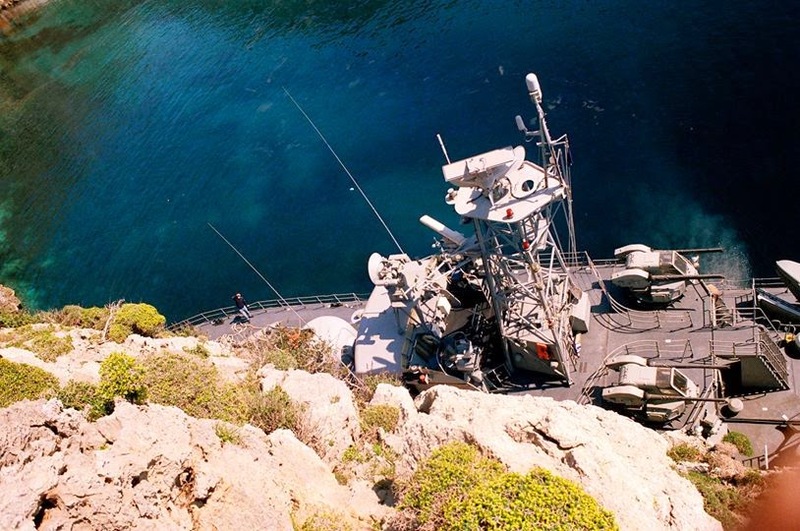 Hellenic Navy, after the purchase and entry into service of the Konidis class FACMs (type Combattante II) in 1972 (P-14 Anninos, P-15 Arliotis, P-16 Konidis and P-17 Batsis, all withdrawn the period 2002 - 2004), decided to buy more boats of the type but larger and with heavier armament. 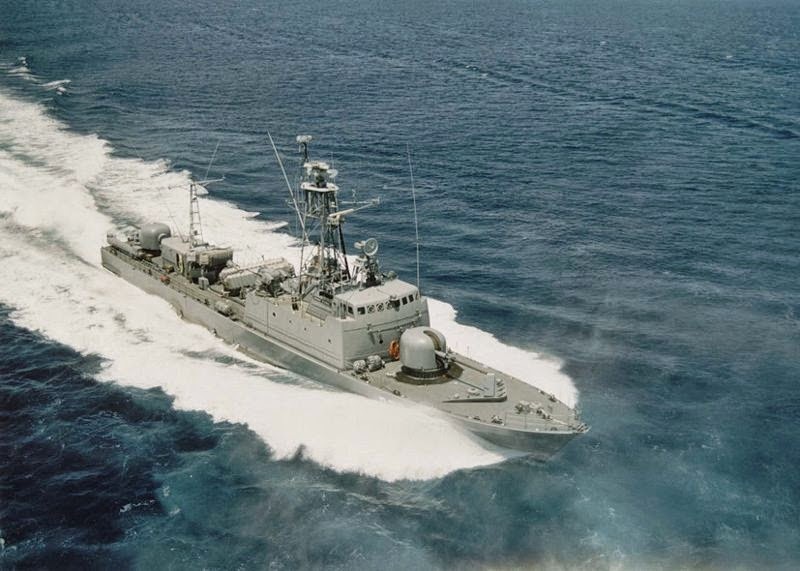 It is worth of mention that the boats of Konidis class were the first missile boats to enter service in the Hellenic Navy and the first FACS worldwide that carried the Exocet missiles, one of the most modern anti-shipping missiles of that time. Thus, in September 1974, HN ordered again from CMN and their shipyard in Cherbourg in France, four vessels of the type Combattante IIIA, an admittedly heavy armed design for its time. The vessels were delivered in the period 1977-1978. Laskos class boats are of full displacement 429 tons (almost double displacement of the previous class), length of 56.6 meters, a maximum speed approaching 36 knots with economic speed of 25 knots and a range of 2,500 nautical miles and a complement of 42 men. 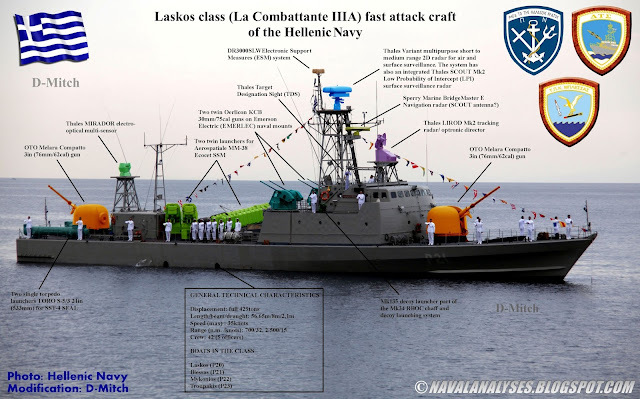 Click to enlarge: modified photo of Laskos class fast attack craft of Hellenic Navy. For a high resolution image click here. 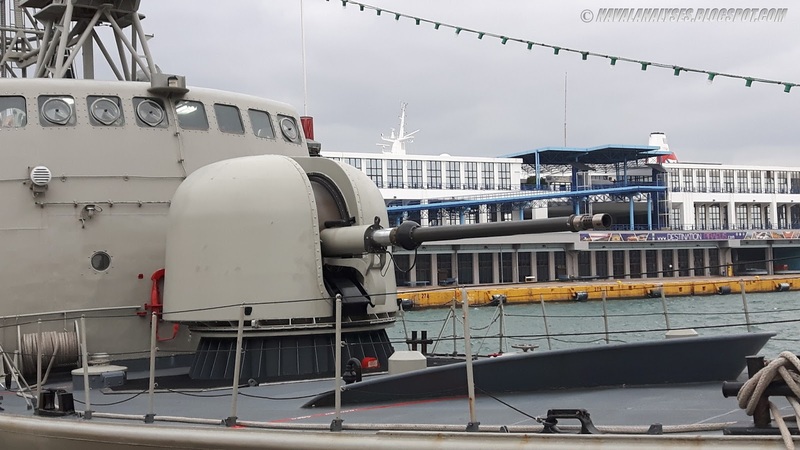 The class is armed with two OTO Melara Compatto 3in (76.2mm) fully automatic guns; one foward at the bow and one at the stern. 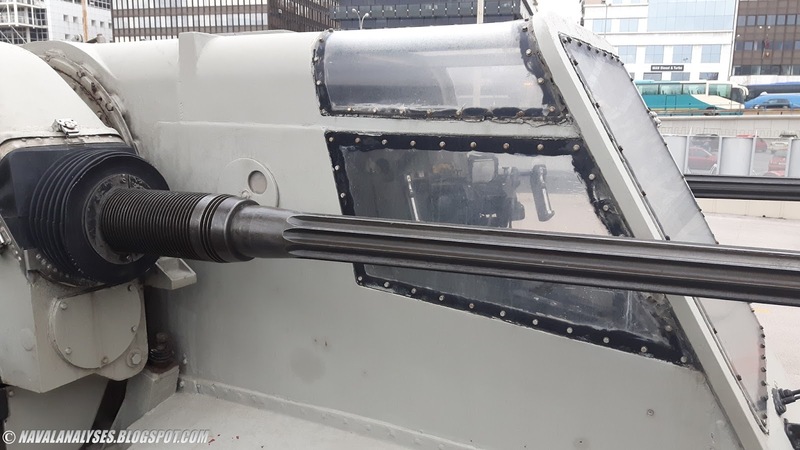 This gun can strike air and surface targets at a distance of 16 km and 12 km respectively; with a rate of fire 85 rounds per minute and weight of shell greater than 6 kg. The vessels also feature two naval mounts Emerson Electric (Emerlec) with twin Oerlikon KCB 30mm/75cal guns. 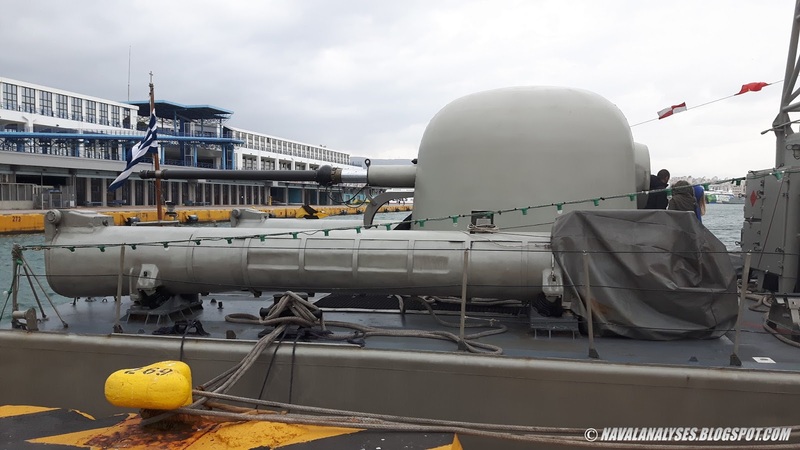 These guns have a dual role, the firing rate is very high reaching 600 rds/min, the weight of shell is 0.420kg with a range of 10,000 meters in the anti-surface role and 2,750 meters in the anti-aircraft role. Each mount has a cabin for an auxiliary operator role who is responsible to start the engines of the system and other secondary duties. 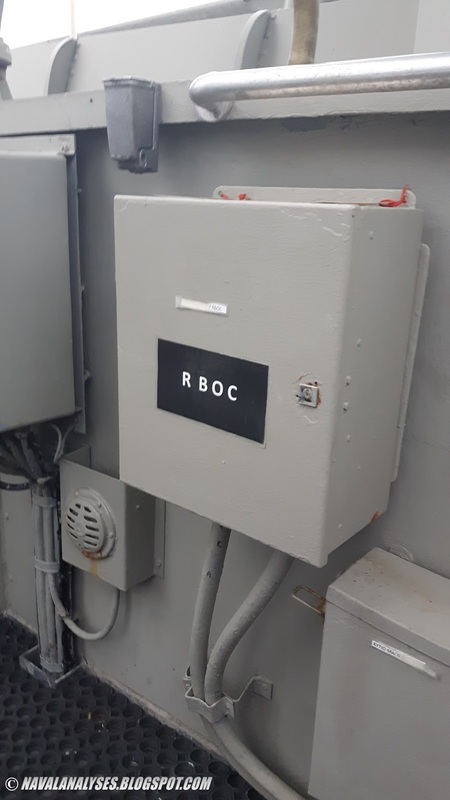 The system is remote controlled from the Combat Information Centre (CIC) of the boat while the operator retains priority on target engagement by utilizing the data from the sensors on board. The ammunition stowage per gun on its mount is 985 rounds. See a video of the system in action in HN service here. The boats carry two twin launchers for the French made MBDA MM38 Exocet missiles which have a range of 42 km and a speed of 0.93 Mach carrying a warhead of 165 kg. The Exocet family of missiles as we have referred to previous articles have deadly capabilities due to the sea-skimming operation of the missile, i.e. 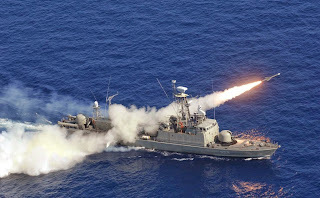 the ability of the missile to fly few meters from the height of the sea (about 2 meters)in order to minimize the recognition of rival radar and infrared seekers and subsequent interception of the missile from the air defense of the target. The Falklands war demonstrated the ability of the missile to destroy or to take out of service large vessels. 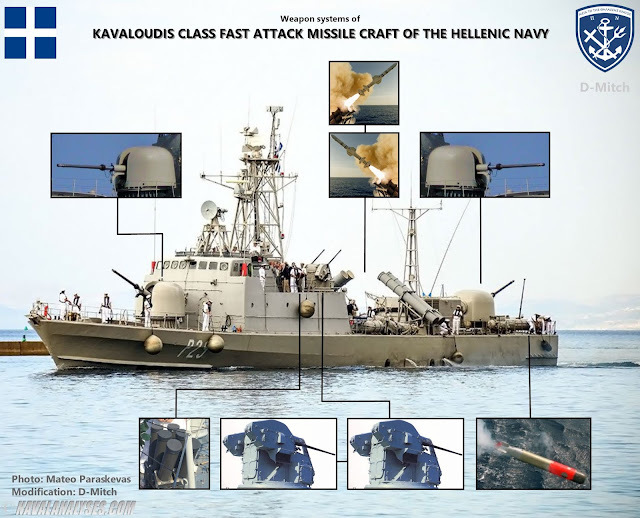 Hellenic Navy nowadays is in discussions with MBDA to replace these missiles on three boats in the class (HS Mykonios will receive Harpoon) with newer models of the Exocet family such as MM40 block II (70+km) that will come from the first three Roussen class FACM which they will receive the newest MM40 block III (180+km). The missile guidance is inertial in mid-flight until turns on active radar late in its flight (active guidance) to the corresponding trigger point for the detection and locking of its target. In order to minimize the recognition from rival radar and infrared seekers and the subsequent attack of the projectile from the air defense around the target, the system maintains a very low altitude during ingress, staying 1–2m above the sea surface (sea-skimming) while the speed is high approaching 0.9 Mach. 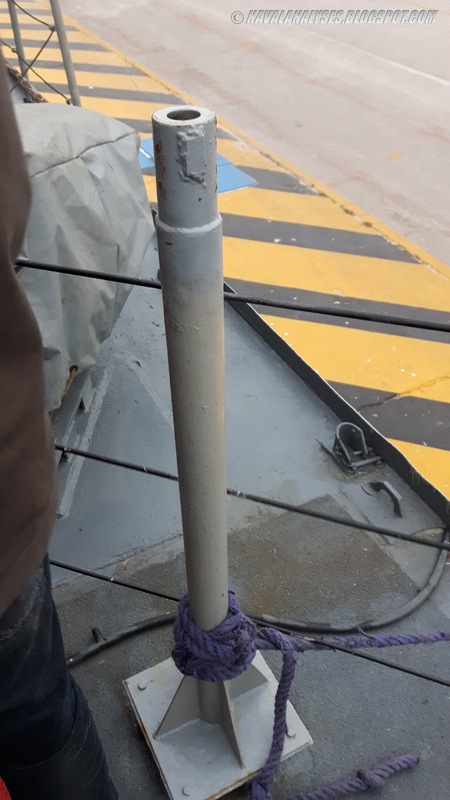 Due to the effect of the radar horizon, this means that the target may not detect an incoming attack until the missile is only 6,000m from impact and thus it leaves little time for reaction of the target’s CIWS. The missile has low signature and it has enhanced target discrimination and ECCM making it very difficult to be intercepted. 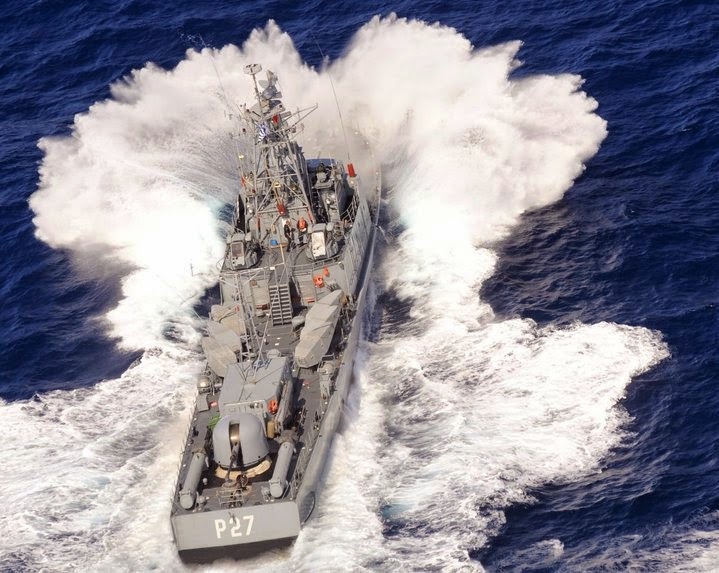 Except missiles and guns, the boat are armed with two 21in (533mm) single torpedo tubes for SST-4 Atlas torpedoes (SST: surface-to-surface torpedo) with a weight of 1,400 kg, warhead of 250 kg and a maximum speed of 35 knots and 12 km range of active search.The armament complete two MG3 machine guns. Their rate of fire is 1,000-1,300 rounds per minute and the effective firing range is close to 1km. 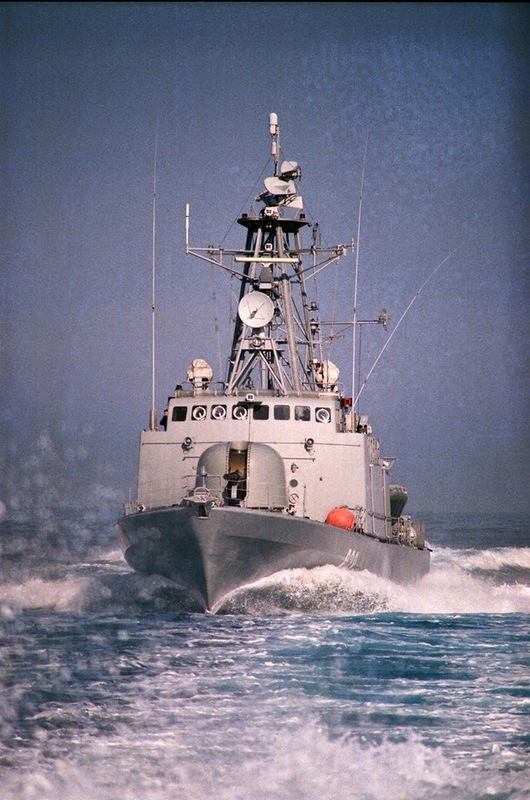 The vessels of the class were extensively modernized with the exception of their weapon systems and handed over to the Navy the period 2008-2011 featuring the most cutting edge electronic systems (the majority of the new electronic equipment are products of Thales Nederland) similar to those of Roussen class missile boats and Machitis class patrol vessels. 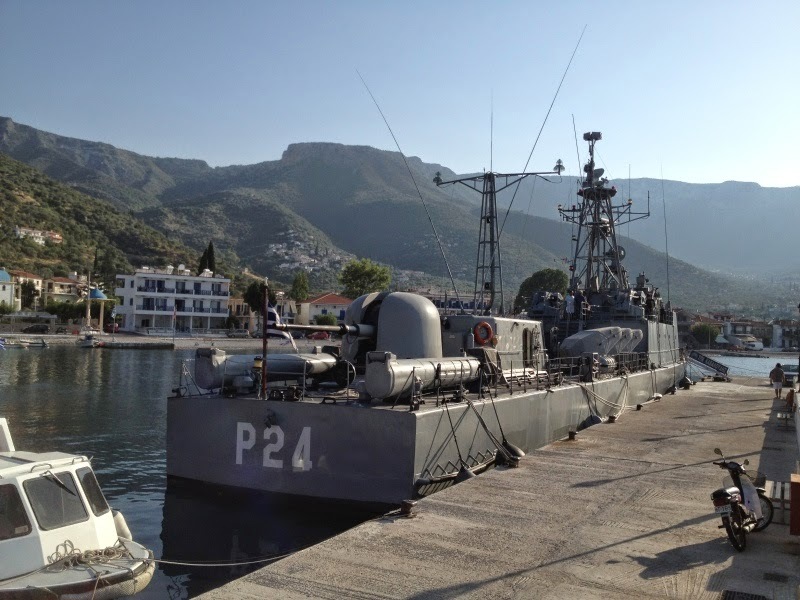 In 2010, during the last phase of the modernization programme, one of the Laskos class boats, P-22 Mykonios, was damaged by fire and retired immediately from active service. The work on the boat to bring it back to active service begun in 2014. The boat will be re-commissioned in November of 2016. Modified photo of modernized Laskos class fast attack craft of the Hellenic Navy. For a high resolution image click here. 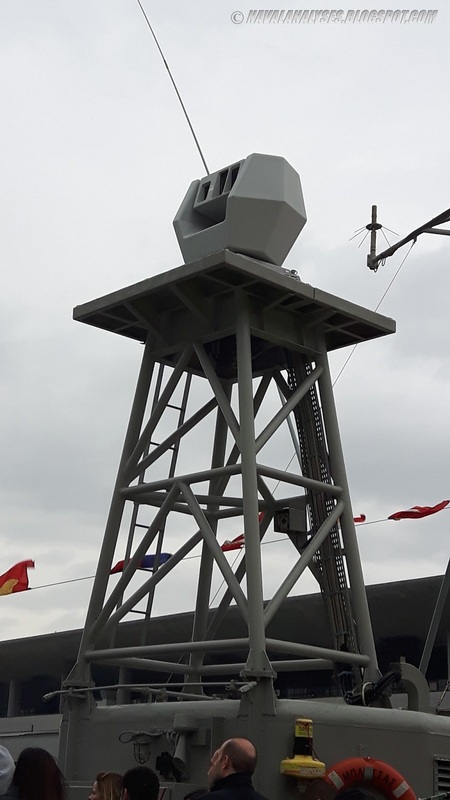 The old Triton surveillance radar was replaced by a Variant two-dimensional (2D) multipurpose short-medium range (up to 70km) surveillance radar. Variant, offers surveillance and target indication. Its principal role is as an automatic, fast reaction time radar sensor, supplying targeting data to weapon systems. Automatic target detection and tracking in 2D plus radial speed is supplied for both air and surface targets simultaneously. For surface targets, it offers 3 gunfire channels. Variant includes a dual-band radar, utilizing both the I- and G-bands (X&C-band). Fully coherent, Variant provides pulse-doppler operation for optimal clutter suppression and air target detection without disturbance by multi-path (or lobbing) effects thanks to the dual-frequency. Outstanding ECM facilities are provided by the ability to operate over two frequency bands, an octave apart, and the third part of Variant, an integral Low Probability of Intercept (LPI) radar. This LPI radar can be used alone for flexible responsiveness, thus providing Variant the unusual ability to operate in a mode that is almost undetectable to external ESM. 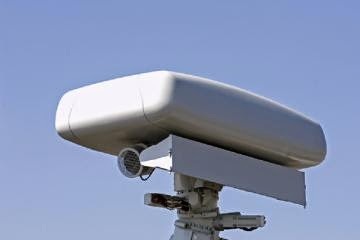 The SCOUT Mk2 is the integrated LPI radar, a short-to-medium range surface surveillance and tactical navigation radar. The system can be operated remotely (radio or line connection). 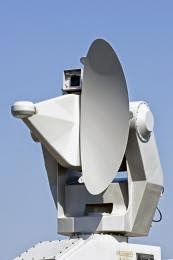 It is an all-weather fully solid-state system of high reliability operating in X-band radar featuring Frequency Modulation Continuous Wave (FMCW) and therefore has an extremely low output power which makes the system ideal for cover operations in hostile environments where radar silence is required and thus its transmissions cannot be detected by ESM systems or radar warning receivers. 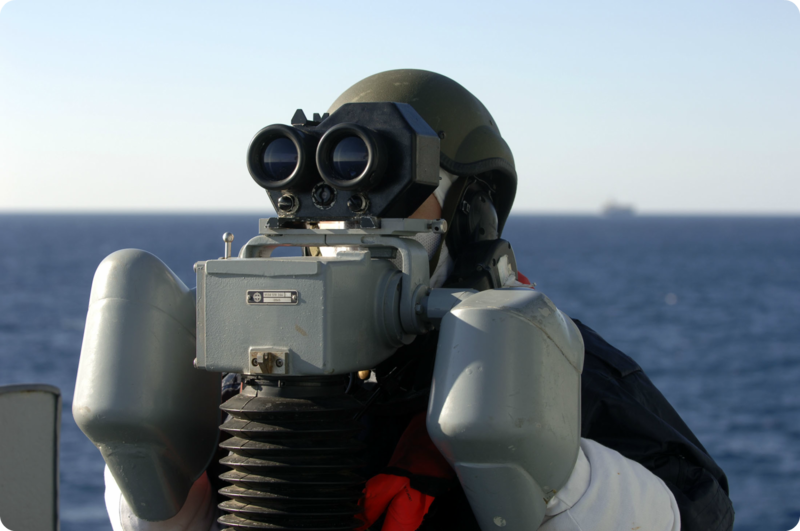 SCOUT Mk2 outstandingly detects targets in adverse sea clutter conditions, thanks to its very small range cell size. 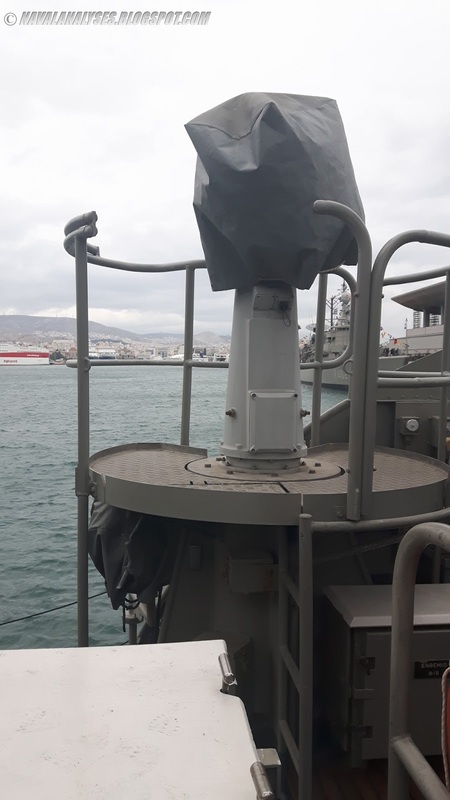 The system is also very suitable for coastal surveillance.Each boat, has two SCOUT, one integrated with Variant radar and one seperate that is integrated with a Bridgemaster navigation radar. 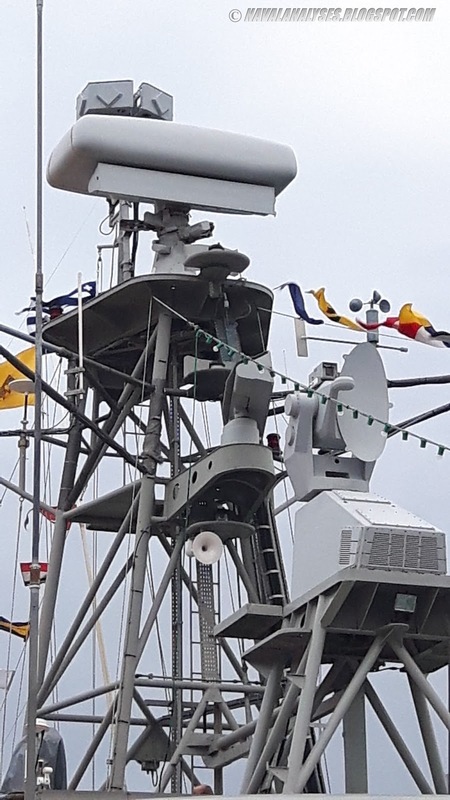 The Decca 1226 navigation radar was replaced by the new Decca/Sperry Marine BridgeMaster E of Northrop Grumman, integrated with SCOUT radar in common antenna, while the fire control radar of Pollux Thomson replaced with LIROD Mk2 fire control tracking system. 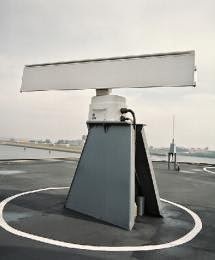 LIROD Mk 2 is Thales Naval Nederland's lightweight combination of a K-band pencil-beam tracking TWT radar and a TV camera. LIROD Mk 2 has been designed primarily for use as a target tracking system for gunfire control and it can operate either as a main sensor in an autonomous weapon control system or as a secondary sensor, integrated in a combat system configuration. LIROD Mk 2 is particularly suitable for short range all-weather operation where high accuracy is required combined with low-level capability, low susceptibility to jamming and the possibility of passive operation. 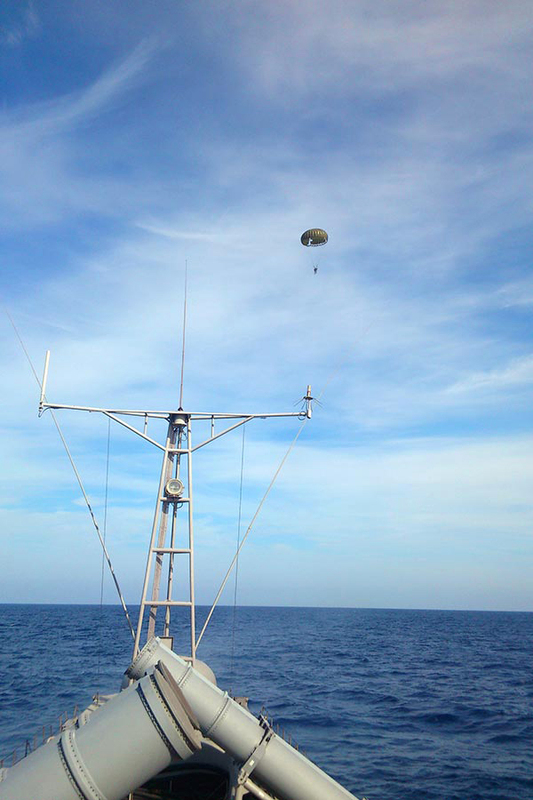 For upgrade and ship-life-extension-programs (SLEP), the system can be adapted to long range search, identification and classification of asymmetric threats as piracy and insurgency. In the sensors equipment of the boats it was also installed one MIRADOR electro-optical tracking and fire control system. 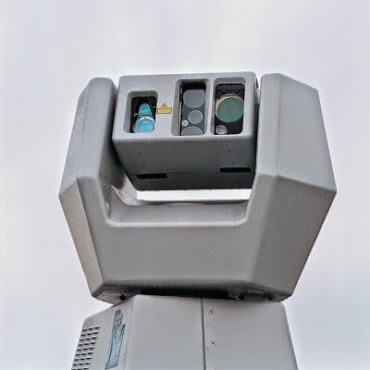 MIRADOR is a compact, fully optronic observation and weapon control system. The one-piece stealthy sensor head houses a mix of electro- optical sensors for TV surveillance, TV tracking, IR tracking and laser range finding. Its lightweight design enables ultra-quick responses. An ergonomically designed state-of-the-art Human Machine Interface completes the system in a stand-alone configuration. 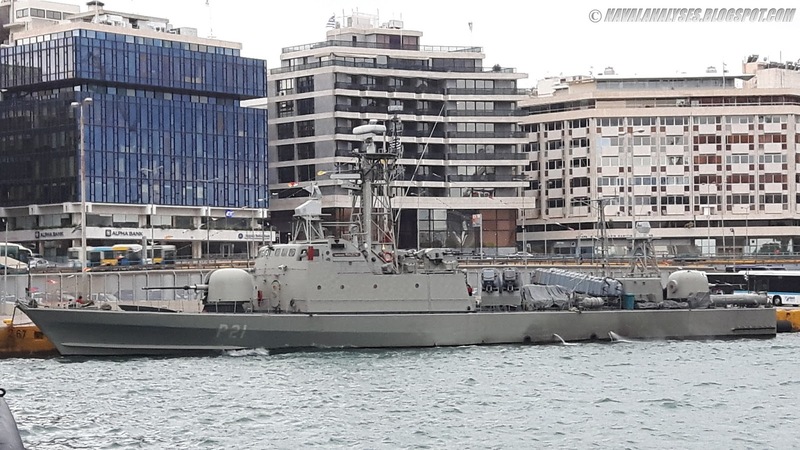 MIRADOR acts as a secondary passive fire control and observation channel on board. 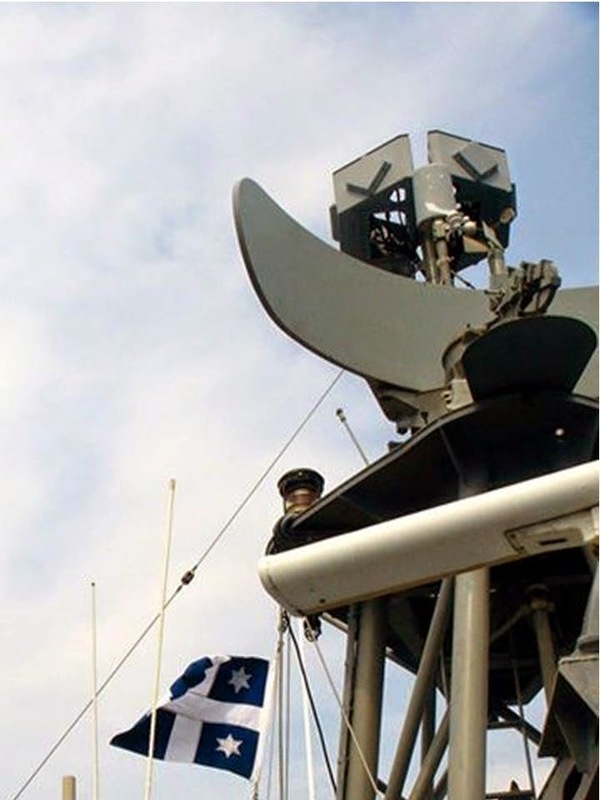 The vessels also feature a WISPR-Net communications of INTRACOM Defense Electronics and a terminal Link 11, integrated together with the other weapons, guns, radars, sensors, EW system, chaff launchers and communications in the modern TACTICOS Combat Management System (CMS) of the vessels with 4 Multifunctional Operator Consoles (MOC) Mk3 (more information here). 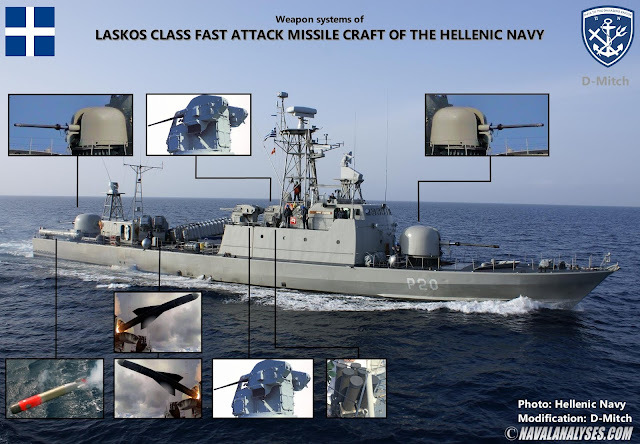 Hard-kill and soft-kill weapon systems of a Laskos class fast attack missile craft. High resolution image here. 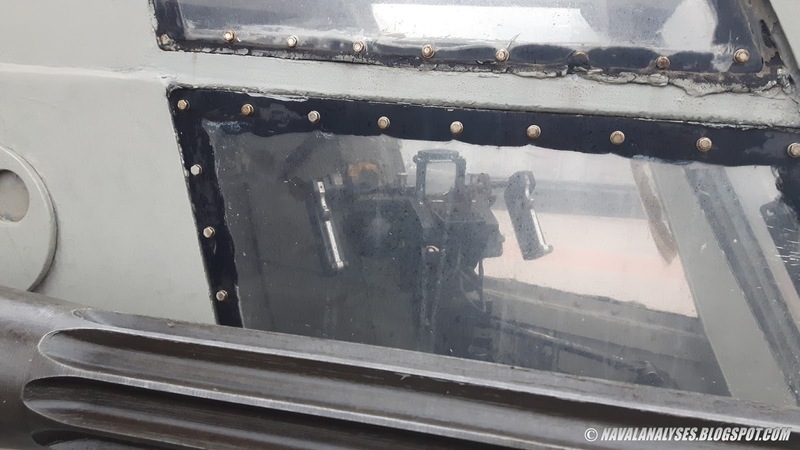 Additionally, the two old Panda optical targeting systems have been replaced with Target Designation Sights (TDS). Target Designation Sight (TDS) that provides means for optical investigation, target designation and weapon firing. The TDS is equipped with binoculars and the latest version includes a Laser Range Finder. Bearing and elevation data are fed into the CMS system but the TDS can also be used for emergency control of a gun or CIWS system. The importance of the function of the TDS is re-emphasized against asymmetric tactics such as piracy and insurgency. 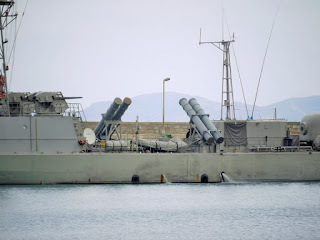 To deceive enemy missiles except the electronic countermeasures, the old system of chaff and flares the boats of the class are equipped with two Hycor RBOC (Rapid-Blooming Chaff) Mk135 launching system which are part of the Mk34 launching system. 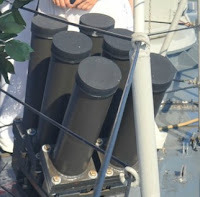 The launchers are either automatically or semiautomatically controlled by the boat's ESM system. Each launcher is a six-barreled mortar fixed in positions: barrel elevation angles are 55, 65 and 75 deg in pairs. The HN made a new order from CMN for six (6) new vessels with the main difference that they carry the KDA Penguin Mk2 Mod3 anti-ship missiles. 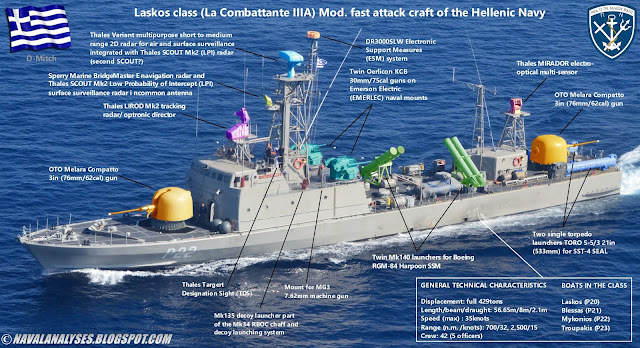 The new class named Kavaloudis class or else type Combattante IIIB. 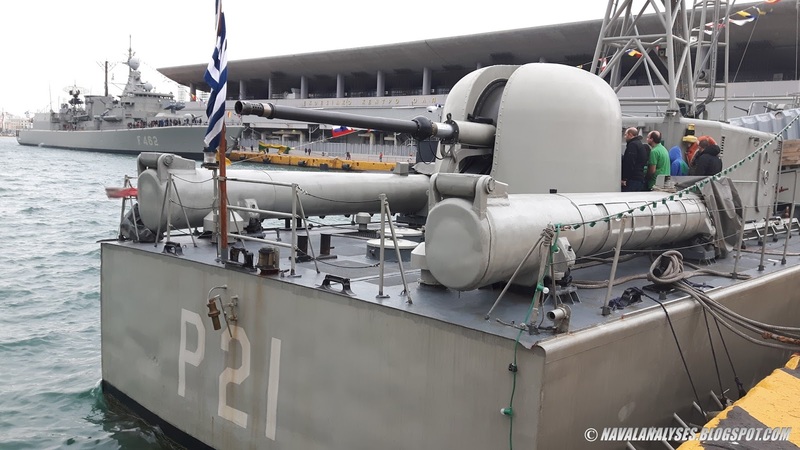 The vessels were built in Hellenic Shipyards and delivered to the Navy in the period 1980-1981. 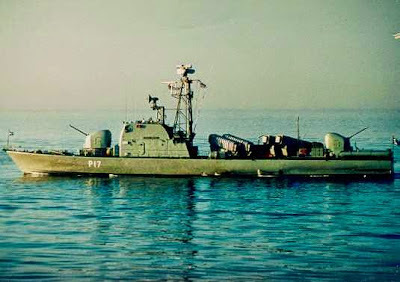 One of the vessels, P-25 Kostakos which was sunk in November 4th, 1996, when it was struck by Samaina a passenger ferry. Four members of the crew lost their lives in that tragic accident. 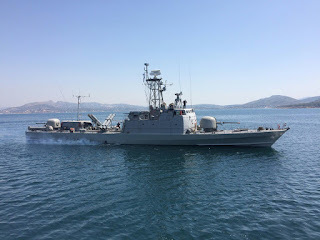 The vessels of the class have the exact electronic equipment of the Laskos class boats before the undergoing modernization program. 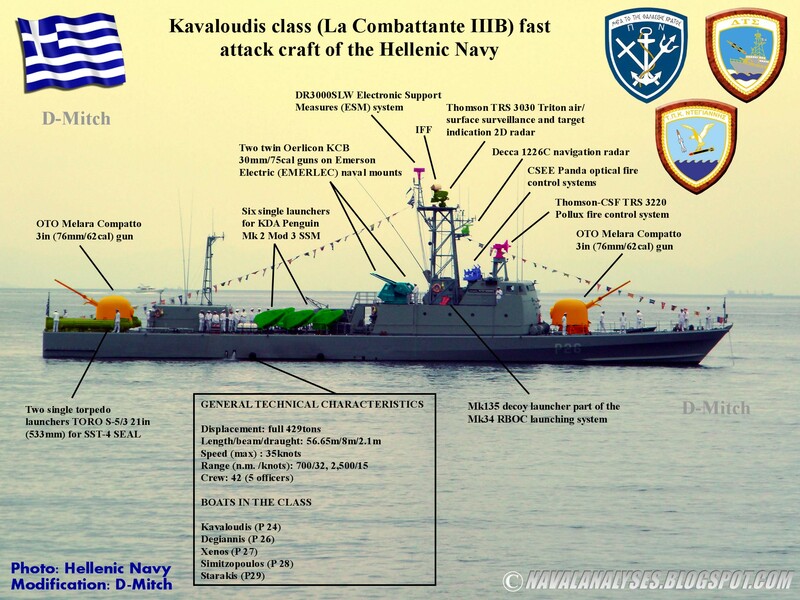 Click to enlarge: modified photo of Kavaloudis class fast attack craft of Hellenic Navy. For a high resolution image click here. 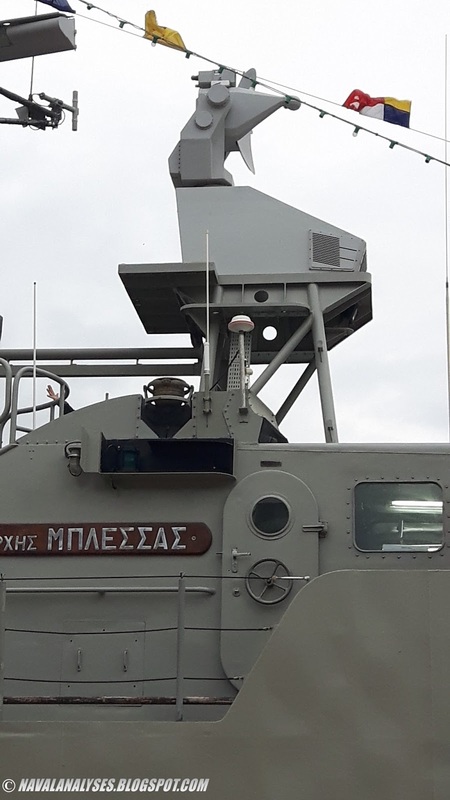 In the electronic equipment of the boats it is included a Thomson-CSF TRS 3220 Pollux Fire Control System (FCS) that is an X-band fire control radar for the Thomson-CSF Vega II weapons control and tactical data system (for missiles and wire-guided torpedoes). Pollux is mainly used in gun control applications. It makes use of a 'fast' conical scan pattern and is circularly polarized. Thomson TRS 3030 Triton is the air/surface surveillance and target indication 2D radar onboard. Triton can detect 2m2 air target at 30-45km. Accuracy in range is 30m. The control of the Penguin missiles is performed by the Penguin Fire Control System 2 (PFCS 2) which receives data from the sensors and the Panda optical director. Panda is an optical fire control system with an onboard ballistic computer. Once the target has been acquired the operator measures its angular velocity by tracking. 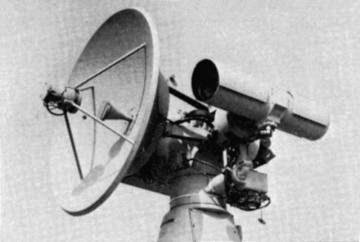 The navigation radar is a Decca 1226C. 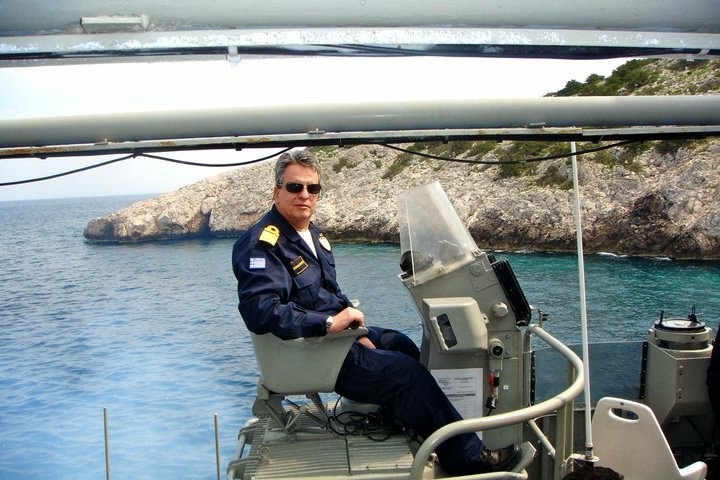 The only modernization that has taken place it is the installation of the DR3000SLW Electronic Support Measures (ESM) system which equips the majority of HN warships, replacing in that way the previous model DR2000 that did not fulfill the expectations of HN. 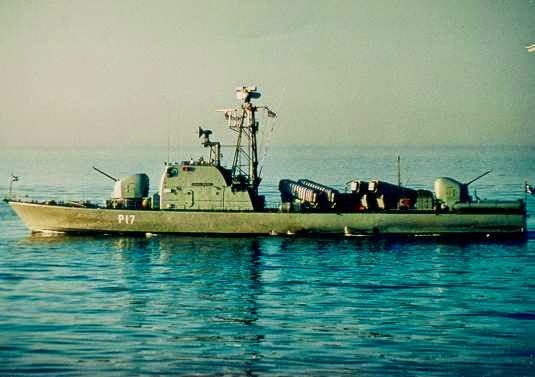 As it has been already mentioned, the armament is the same except the anti-shipping missiles witch is six KDA (former Kongsberg, Norwegian company) Penguin Mk2 mod 3 in six single launchers placed amidships. The boats of the class, as their Laskos sisters, are equipped with two Hycor RBOC (Rapid-Blooming Chaff) Mk135 launching system which are part of the Mk34 launching system. The launchers are either automatically or semiautomatically controlled by the boat's ESM system. Each launcher is a six-barreled mortar fixed in positions: barrel elevation angles are 55, 65 and 75 deg in pairs. The Penguin missile, is an all-weather fire-and-forget anti-ship missile with a highly accurate inertial navigation system that integrates a high resolution passive IR seeker which provides a high degree of discrimination and target selection. The IR seeker also allows the missile to operate in close proximity to land and in open waters. The passive IR seeker makes it possible to operate close to land while it is unaffected by all known IR decoys and ECM systems. The missile of this Mark has approximately a range of about 34km with a subsonic speed (Mach 0.8) and with a warhead of 120kg. With up to 180 degrees waypoint turn, mid course sea skimming, weaving and erratic maneuvers in the final stage of attack, the missile has advanced penetration capabilities through enemy defense lines. The missile is designed so as to hit the target in the waterline with a downward penetrating angle. The delayed fuze mechanism ensures warhead detonation under the waterline, thus creating maximum damage in the target. Thus, the combination of covert targeting, passive flight path and selectable waypoint manoeuvres makes the Penguin a very effective weapon against surface combatants. Hard-kill and soft-kill weapon systems of a Kavaloudis class fast attack missile craft. High resolution image here. The Penguin missile is ideal for countries like Greece with the high concentration of islands. As it was mentioned, Penguin can fly a course to the target using several different flight paths that enable the missile to fly over and around islands before arriving at the target with no warning. However, because the missile is IR, has limited capabilities in bad weather conditions. 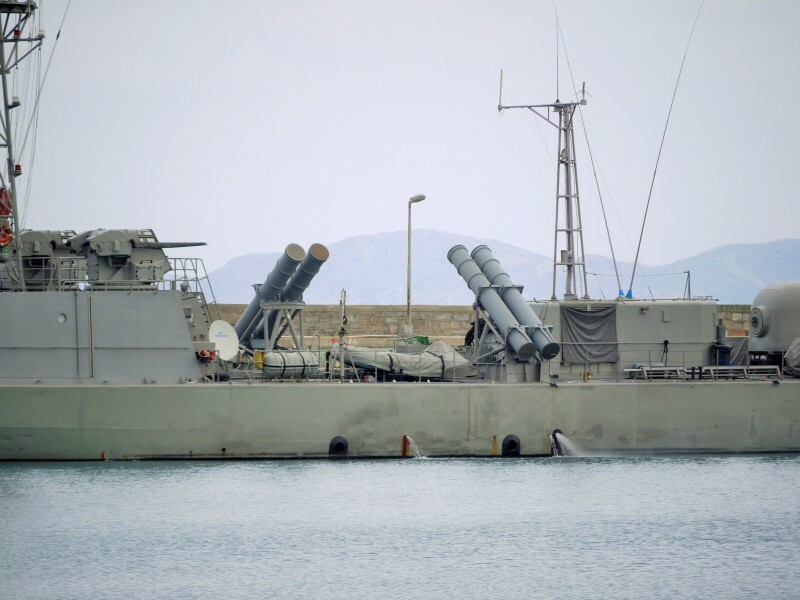 The boats of the class are currently replacing their Penguin launchers and missiles with Harpoon missile launchers which came from older vessels (S148 class FACM, FRAM destroyers). 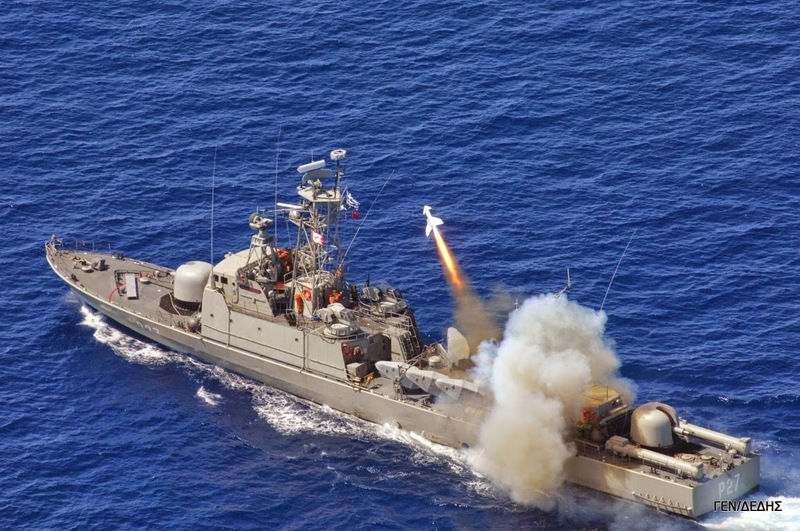 The Harpoon missiles have four times the range of Penguin missiles and thus they increase dramatically the efficiency of boats' armament.